Professor Bynum works on the religious, cultural, social, and intellectual history of western Europe from late antiquity to the end of the sixteenth century. 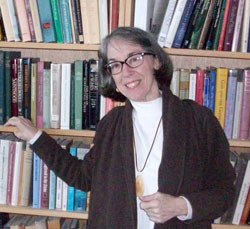 In the 1980s and 1990s her work on gender and the history of the body established some of the paradigms still used in medieval studies. Recently her research has focused on devotional practices, especially devotional objects, in the fifteenth and sixteenth centuries. She is currently exploring the paradox of Catholic survivals, including the survival of women’s monasticism, in Protestant Germany. Ralph Waldo Emerson Prize of Phi Beta Kappa, and Jacques Barzun Prize of the American Philosophical Society, for The Resurrection of the Body, 1995, 1996. Orden Pour le Mérite für Wissenschaften und Künste of the Federal Republic of Germany, elected 2012. Grosses Verdienstkreuz mit Stern (Grand Merit Cross with Star) of the Federal Republic of Germany, awarded 2013. Gender and Religion: On the Complexity of Symbols. ed. Bynum, Harrell, and Richman, (1986). Christian Materiality: An Essay on Late Medieval Religion (2011).